It's been a great weekend for getting outdoors. Yesterday I did a 6+ mile run at Belmont Lake and later that afternoon my wife, son and I went on a long hike in Stillwell Woods. Considering that it's early August the weather was very comfortable, especially with the tree cover keeping the interior temperatures relatively cool. I considered returning to Stillwell this morning for a run but decided to stay closer to home. I wish I could run to Stillwell from my home rather than drive the five minutes to get there. If not for the major roads I'd need to cross I'd do that. After yesterday's run and hike my feet were still a little swollen so I chose my Kinvaras today. The Kinvaras are light and the toe box is flexible so I thought they would be a good alternative to my conventional shoes. I set out to run a moderate distance and picked a route that took me west along Jericho Turnpike for about a mile until I turned into neighborhood #4. It was a nice change of scenery as I haven't run in this neighborhood in almost a year. There were some good hills to follow both up and down and I traveled the perimeter road until I reached an outlet that allowed me to cross over to my main neighborhood. Considering all the running and hiking I'd done the day before I did fairly well on today's run. 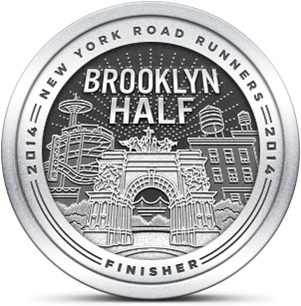 I definitely slowed down in the last couple of miles but did maintain a credible pace overall. When I reached home I realized how humid it was. While running it wasn't that noticeable because there was little sun due to low cloud cover. When I finally stopped I was amazed by how much I had sweat. The sprinkler system was on in front of my house and I stood in the path of one sprinkler head to cool off a little. It took a cool shower and then some to fully restore my comfort level. I'm glad to have got my workout completed early today so I can focus on the activities of the day. I feel great and I'm happy with my performances over the last week. A special shout out to Adventure Girl today. She's running the Haulin' Aspen half marathon in Bend, Oregon this morning. Lots of high altitude running and a start with 8 miles of steady elevation (!). 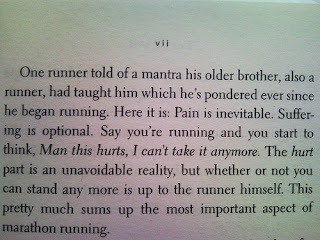 Once again, to quote Murakami, "Pain is inevitable. 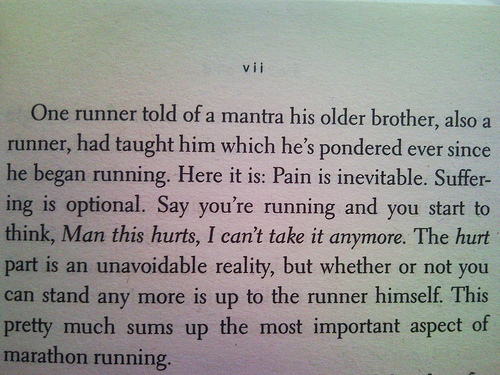 Suffering is optional."